This post contains affiliate links. Thank you to Le Decor Box for sponsoring this post, all opinions are my own as always. Thank you for supporting the brands that support The Classic Brunette! I know Mother's Day isn't for another month or so, but it never hurts to start planning ahead! Plus, this gives you plenty of time to get ahead of the curve without stressing if your present will arrive on time. This year will definitely be different since my mom isn't around, but that doesn't mean I can't celebrate my favorite mom figures in my life. (I'm looking at you Leslie and Veronica!) My mom was the biggest supporter of my blog, so even though I don't have her around for her holiday I know she's with me every time I write and would encourage me to share my Mother's Day thoughts and gifts with you! I've gathered a few of my favorite gift ideas above, but also wanted to share another option for those of you who love supporting small businesses! I recently came across the subscription service called Le Decor Box. They are launching this month (!!!) and have the cutest items inside. Emily, the owner is so kind and curates each box with fun, festive, and beautiful products each month that are perfect for decorating your home. 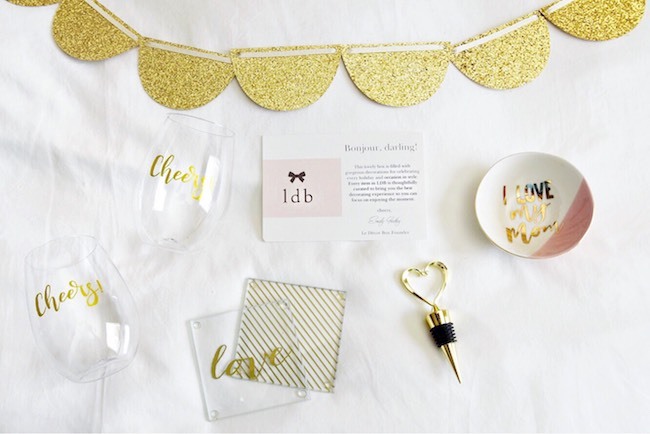 LDB is a $55 monthly subscription box service that provides 6-8 decor items that are themed by holiday or season. I think it's the perfect gift for the mom that loves to add a touch of fun to her home or office space. Below is the May box and all the goodies inside! My favorite items are the glitter garland and the heart shaped wine stopper! You all know I'm a sucker for anything and everything gold, so everything in the box is going to look perfect in my place. I'm excited to hang the garland in my new living room when I move! Are you looking forward to Mother's Day? Also, I've never heard of ldb before! 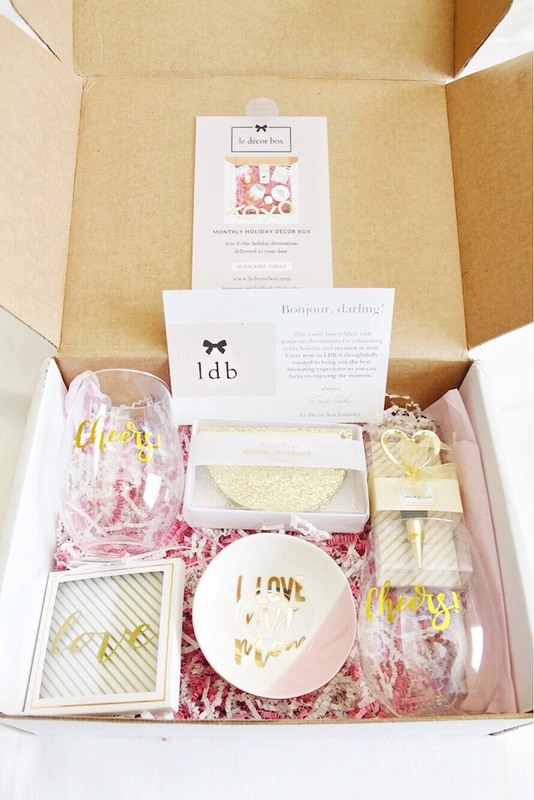 And I really like the idea of having a decorative subscription box! These are great finds! I love the pitcher and the 52 lists journal, especially! Oh these are all great ideas and the le decor box is awesome too! 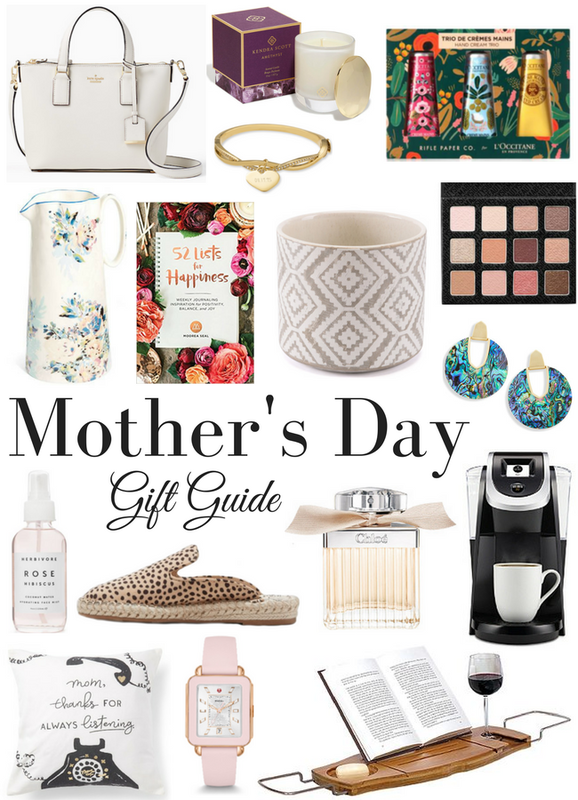 I love these wonderful mother’s day gift ideas! Thank you for sharing a little bit about my brand :) I’m so thrilled that you’ve the items. Enjoy! I need to start thinking about Mother's Day. I always wind up putting it as last minute but I really need to start thinking now. These are great ideas!! I love that floral pitcher!! I want that floral pitcher! I can't believe that next May my baby will be here! omg i haven't even thought of mothers day yet ha these are such great gift ideas! These are all great gifts!!! My mom would love all of these! I personally would want the purse and bath caddy for myself. Lol. I have been wanting to see about those Kendra Scott candles as well!! Ha, I definitely need to get my mom that pillow sham! That Chloe perfume is one of my favorites! You can't go wrong with any of these! These are all such great picks! I really love that Kate Spade purse! Love the idea of monogramming the cross body! And I love the garland! Kind of want that decor box for myself haha! That's such a unique idea considering how many subscription boxes there are these days. Love these ideas! I actually have those animal print espadrilles! So cute! Really liked your nutcracker sweet gift shop. Have bought plenty of baby baskets from you guys for the past many years. Love all of this! Especially the watch! Mother's Day is celebrated all around the universe. It seems to become a worldwide thing that cultures put aside annually to celebrate the action of motherhood. To pay tribute both to the woman who conducted that miracle: your mum and also into the miracle of birth. Maybe not anywhere celebrates Mother's Day on the 'Mothering Sunday' whilst the UK. Now you get free latest "mothers day memes for facebook"
Such an interesting gift ideas, i like this.